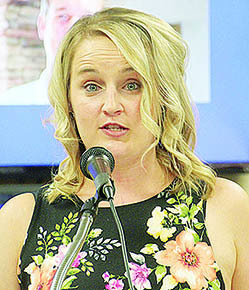 Newman Grove area residents noted good progress for its foundation at the annual meeting of the Newman Grove Community Foundation (NGCF) last Friday, July 20. During the past year, the endowed fund has grown by more than $30,000, from $218,571 last year to $248,967 on May 31, 2018. Major gifts were received from the Bud and Georgianne Gerhart Memorials, Charles Carlson, Jeff and Becky Gerhart and Judith Duhachek. Total grants of $6,300 were awarded during 2017-18, including $3,000 to the City of Newman Grove for park improvements and $1,200 to the Newman Grove Housing Authority for bathroom remodeling. Brad Cox, chairman of the foundation board, welcomed the members. Vanessa Arrequin, a 2018 Newman Grove graduate and recipient of the annual Bluejay Foundation/NGCF Scholarship, expressed appreciation for the scholarship. She plans to attend Northeast Community College with a major in behavioral science. Keynote speaker was Emily Dohmen Afrank of Norfolk, a Newman Grove native who was recently named Northeast Nebraska Person of the Year. Read the complete story in the July 25 Albion News, Print and E-Editions.